Having unwittingly unleashed upon myself a tsunami of abuse by publishing a series of essays questioning the value, or validity, of the European musical tradition — accompanied by, I thought, the “say something positive,” “well, what’s the alternative?” suggestion that the work of Harry Partch — American microtonal composer, music theorist, instrument maker, dramaturge and hobo — was worth considering as a model for a true, Aryan music — I was delighted to recently find, on my Free Kindle radar no less, this work of one André Pogoriloffsky — The Music of the Temporalists — an apparently self-published work of fictionalized music theory where the theory taps the same tuning forks I tried, but the fiction adds in a Lovecraftian angle. Short excerpts were presented on the piano to his musician friends who confirmed that the temporal fabric of that music could not be rendered satisfactorily with help from the traditional, bar-rhythmical, semiography. Between that point and 1994, A.P. tried to formulate a theory and a notation for that music, the first result being his first published book — “Energies of musical time –essential studies of pulsatory functionalism” (ARARAT Publishing House, Bucharest, bilingual edition Romanian/English). Despite a boffo title like “Energies of musical time — essential studies of pulsatory functionalism,” the public seemed unmoved; hence this work, which takes an entirely different tack. A Parisian drugstore owner and amateur pianist experiences a two-year mental trip as an avatar in a parallel (Temporalist) world in which music is cultivated as the art of time rather than the art of sound. There he meets a musicologist called Jean-Philippe and an old psychologist, Herr Sch . . .; they teach him all they can about their musical theory and its cognitive aspects so he can transmit what he has learned to his own music culture. It just so happened that in this case the music in question is not part of what we commonly name „the art of sound“ but rather „the art of musical time“. The Lovecraft angle, not apparently a deliberate attempt at pastiche, comes first from idea of the protagonist narrating a tale of how his apparent sleep or coma and subsequent personality shift some years ago was actually a forced exchange of minds with an alien intelligence, and what he learned while in his new body, as in Lovecraft’s magnum opus, The Shadow Out of Time, but the rather peaceful transition here suggests more the protagonist of William Hope Hodgson’s The House on the Borderland, itself a favorite of Lovecraft’s. There’s even a moment of delayed recognition of inhabiting a new, alien body. The way these people conceived their music is evidently linked to the temporal nature of their notional communication . . . the significance of the words is conveyed by the duration, accentuation and the prosodic function of each syllable of a word – and not by the series of vowels and consonants through which this word is being pronounced. Now, that leads to another point. You may have already noticed certain . . . oddities . . . in spelling and punctuation. Some are deliberate attempts at rendering the alien effect just mentioned; some, like the up and down quote marks, are a European thing. But there is an overall strangeness in words and syntax throughout, arising from this work being not only self-published but self-translated, or perhaps more accurately, written in English by a native speaker of Romanian. Many people have commented online that this makes the book either unnecessarily hard to read, or else simply impossible to take seriously. Constant Readers will know that I am rather sensitive, and incensed, about this sort of thing in expensive, professionally edited books. Here, though, not only do I admit we should cut the struggling author some slack, I think it actually adds quite a bit to the book, mainly as an estrangement device, at times rivalling the productions of Dada, or surrealist automatic writing. Sometimes the results are just quasi-humorous: brain science, for reasons explained below, is the dominant field in their cultures, but when we are introduced to his host’s wife “Monique who, of course, works in the domineering work field,” one’s mind makes some unexpected inferences. On the other hand, I’ve learned some real words from the author, such as “bantling,” and most importantly in the context, as it occurs frequently in conjunction with descriptions of temporal sequences, “crepitus,” whose unity of bone-crunching sound and sense would have delighted Lovecraft. I should not leave the impression that all the humor is unintentional. JP actually has a sly, deadpan wit that makes the book enjoyable to read as his little bombs go off in the text. In his opinion, in both our worlds, the difference between bad repetitive music and good repetitive music is not big enough. It seems that one simply cannot embrace enthusiastically the undisputable values of the German culture without significantly altering the meaning of one specific word: „superior”. As the last quote hints, a lot of this humor comes from a wonderful character, the Herr Professor Sch . . . no, wait, I have to explain a couple things first. Although their musical evolution is parallel – symphonies, academies, concert halls, etc. – the music of the Europeans and the Temporalists diverges due to the nature of their spoken languages. In ours, meaning is conveyed by consonants and vowels; a given word “means” the same, no matter how fast or slow it is pronounced. And thus, as one Amazon reviewers says, a Beethoven symphony has the same significance, no matter at what speed it is played. Conversely, for the Temporalists, meaning is conveyed by rhythm, and the sounds are relatively unimportant. The temporalist mind starts to fathom words the same way our grandmothers saw handsome officers, broken hearts and secret romances in the coffee dregs. Consequently, the words and names heard by the protagonist seem like arbitrary, constantly changing sounds, and his are perceived as equally arbitrary, meaningless rhythmic pulsations. Before I chose you, I chose the French culture. I managed to persuade my colleagues that yours is the only civilization that is both sufficiently advanced and apparently not so obsessed „to be right” all the time. the embodiment of der zerstreute Professor and the only spectacled temporalist I ever met in the two long years that followed…. He is wearing the glasses in order not to see what happens around him. Putting the two together, we get a surprisingly effective running gag in which the Professor’s name is rendered by a changing, apparently arbitrarily chosen Germanic soundcluster, followed by “etc.,” such as “Herr Professor Schopenhaueretc.” — presumably it’s always the “same” name as long as the rhythm stays the same. But all this is in service of presenting AP’s musical theories. It’s an interesting method, since the non-professional reader gets a story that conveys some interesting ideas, while, hopefully, the music theorist who dips into it gets, not another dry monograph about some theoretical system, but an introduction in medias res to a living, concretely embodied musical system. And as I’ve said, JP’s discourse on the “temporalists” recalls many themes I took up in my consideration of the decadence of European music and the microtonal alternative of Harry Partch. Although based on an entirely different mentality, the Temporalists, having undergone a leap forward in cognitive evolution (“The Brain Revolution”), have tried to base their musical theory on a sound basis of acoustical science, like the Traditional systems of India and China. The first temporalist musicians have discovered empirically that different rows of equal pulsations evoke different affects. . . . It was widely believed that the reason why temporal modes are associated to distinct affects is of a purely cultural nature location. [But then they] genuinely let themselves [be] influenced by the quantified results from experimental psychology. The gradual disclosure of human brain secrets would later baffle musicians, who thus found out that almost every temporal mode corresponds to a distinct psychophysical phenomenology, marked by a series of perceptual thresholds that I am about to describe in the following pages. In this world every temporal innovation that is proposed by composers by means of their works is immediately dissected by a plethora of musicologists-converted-to-psychology who decide Urbi et Orbi whether our brain may or may not assimilate the respective temporal structures. The fact that the 50 ms grid imposes the use of a series of artificial temporal modes, such as IOI 100 ms, makes this resolution create in temporalist concert halls a peculiar atmosphere of musical familiarity, the same way we feel familiar with compositions created within the dodecaphonic tempered system, even though it contains a series of adjusted natural intervals, such as the tempered major third itself. So close is the resemblance, that JP occasionally forgets himself and presents my European problematic as his. Remember, the two musical systems, though parallel, arise from entirely incompatible physiologies, he sometimes analogizes the pre- and post-tempered European music. It is as if a music loving God had cloned the humankind just before Renaissance . . . wouldn’t it be great, if we could observe the bifurcated evolution of a given tradition? It is perhaps resembles the tempered tuning system of your music: a kind of compromise that is extremely profitable yet highly artificial at its core. [We] wouldn’t want you to believe that everything started with the temporal equivalent of your Well Tempered Clavier. He and his fellow instrumentalists are of the opinion that pulsatory temperance only massacred the real musical culture of their civilization . . . that our restitutive musicians, my son included, try to revive these days. I would be remiss if I left the impression that AP is promoting his system as the “correct” or “superior.” In fact his aliens ultimately plan on a grand unification of the two systems. I am envious of the future generations who in either world will be able to master both sonorous and temporal Harmony. Ah yes, vibrant diversity! Unfortunately, we’ve seen this before. It’s not a problem that goes back only to equal temperament; it’s a fundamental flaw in the system itself, going back to the Greeks, who basically combined elements of the Hindu and Chinese systems. As my critics were wont to say, well, doesn’t that make it better? The Western musical system has emerged from a mixture of various traditions that, because of complete confusion in the theoretical definitions, were brought together in a rather haphazard way. . . . This system would have had every advantage had it not been based upon a fundamental confusion: the notes that form constant chords are not the same as the ones required for modulation. The temporalist professor claimed that our Western civilization “wouldn’t have made such a mockery” in the last decades, of its own musical tradition, had the ways human brain relates to sounds secured survival, food, orientation in time and space or procreation. If the sonorous polarizations had such an existential fundament, Western musicians would have paid infinitely more care in infringing upon the laws that seem to constitute the Harmonic Code. But, all carping aside, this is a remarkable book, combining weird fiction, musicology, and acoustical science; truly one of a kind. Since most readers will find the long sections on acoustic phenomena as good as jibber-jabber anyway, it took a special kind of genius to decide to present it in the context of a Lovecraftian journey, and then add the “found art” touch of random linguistic bafflement. Enjoyable and recommended for all. And perhaps, the musically talented — or at least musically learned — will be inspired and create something fundamentally new for the alt-Right culture to call its own. Somebody may get the fever for this notion and find a personal sound or language with it, and, with enough charisma and determination, develop a small sonic community that actually produces a sound that grows an audience and inspires other musicians in the way that Ornette Coleman or Harry Partch did — or maybe a whole band might explore this notion collectively. These could be the next steps where this musical possibility finds a language that can be socially transmitted — always a long shot, but never genuinely impossible. Let them bark, because one day a young musician who has read your book will pick up his or her violin or clarinet and, inspired by your effort, will discover that, indeed, musical time is much more than the bar-rhythmical system has to offer. 1. “My Wagner Problem – and Ours” and “Our Wagner, Only Better: Harry Partch, Wild boy of American Music;” reprinted in The Eldritch Evola . . . & Others (San Francisco: Counter-Currents, 2014). 2. Sic, and more on that sort of thing later. 3. “This little essay is a great declaration of war; and regarding the sounding out of idols, this time they are not just idols of the age, but eternal idols, which are here touched with a hammer as with a tuning fork: there are no idols that are older, more assured, more puffed-up — and none more hollow.” — Die Götzen-Dämmerung (Twilight of the Idols), by Friedrich Nietzsche ; Preface. Contrary to a convenient later consensus, Nietzsche’s doubts about Wagner were neither a late development in his thought, fueled by jealousy or even a symptom of madness, nor uncommon among the incipient White or Aryan Nationalist movement; see Anthony Ludovici’s introduction to his translation of The Case of Wagner; Nietzsche Contra Wagner; Selected Aphorisms (Edinburgh and London: T. N. Foulis, 1911). 4. Again, sic., and again, to be explained. 5. “Talking about music is like dancing about architecture” — Elvis Costello, or maybe not. 6. The author/protagonist is advised to use a “julesvernian filter” by his alien hosts. Having read nothing of Verne’s but some Classic Comics, I can’t say much about that. By this time, I would think. Though, Lovecraft must be as familiar to the French as Poe; see “Michel Houellebecq’s Sexual Anti-Utopia,” reprinted in my forthcoming collection, Green Nazis in Space! (San Francisco: Counter-Currents, 2015). 7. As most people think, but not Graham Harmon; see “Lovecraft as Heideggerian Event” in The Eldritch Evola, op. cit. 9. The commentator above’s use of “avatar” suggests a more superficial source for the plot device. 10. “Cthulhu,” for example, which is frequently “described” as a desperate attempt to render in human orthography the pronunciation of a ghastly name formed on utterly alien lips, using an utterly different phonological system. As opposed to the lazy writer’s idea of just adding “space” to the name of something; see, for example, “Naming Your Colony World” at TV Tropes, here. “I think I’m going to call it . . . ‘Bob’.” — Cale, Titan A.E. 11. “Don’t mind him, he’s from Barcelona.” — Basil Fawlty, frequently. 13. One recalls that despite his reputation for slowness, Furtwängler’s wartime performances of Beethoven are taken at breakneck speeds. 15. One recalls J.-K. Huysmans, who identified with the “Nordic” parts of France and Britain, and despised the Southern, Mediterranean culture so beloved by food tourists. Evola made a similar distinction between the true Roman and the degenerate pasta and mandolin lovers whom Mussolini tried and failed to convert into the former, as does the Northern League today. 16. I admit to a weakness for this kind of thing. I am reminded of the way variations of HCE, H. C. Earwicker or Here Comes Everybody recur throughout Finnegans Wake; I recall laughing uproariously when “ole Massa Earwicka” showed up during slave times. Maybe it’s an Irish thing; think of Beckett’s protagonists, Murphy, Molloy, Malone, etc. 17. Sound is only “a strictly necessary background — since discrete musical time cannot be perceived in the absence of a physical dimension to materialize.” “The temporalist mind starts to fathom words the same way our grandmothers saw handsome officers, broken hearts and secret romances in the coffee dregs.” To “hear” temporalist “music,” one must “ignore apparent melodic lines and harmonic coincidences and focus on the temporal plot of this or that musical composition.” “It suffices a moment of relaxation, in which the tormented eyes look for a resting point somewhere at the horizon for a 3D contour to emerge from the hitherto fuzzy picture.” The gestalt moment resembles the Seinfeld episode where Mr. Pitt was trying to “see” a 3-D painting: “You told me to keep my eyes out of focus. That is misleading. You want deep focus!” (Episode 606, “The Gymnast”). 19. 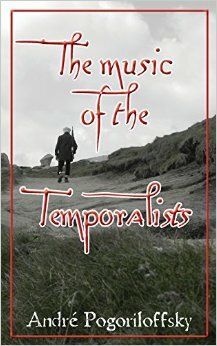 I can find no reference in the book or online linking JP and Partch, however the Facebook page devoted to The Music of the Temporalists does link to a biographical film on Partch, so I guess that makes them Facebook friends. 21. I.e., is purely relative to particular culture . . . I think. This at least is the opinion of most Western musicologists: cavemen just started blowing through pipes for no reason and “figured out” the relation of tone to effect. 22. See the material presented in the Wagner and Partch essays in The Eldritch Evola. 23. A favorite deliberate spoonerism of my own; again, it’s an Irish thing. 24. “Spiritist” may be a mistake, but if so, an inspired one, as this was the contemptuous neologism Guenon used for “spiritualists.” See The Spiritist Error. 25. Although someone commenting online about Patrick Brennan’s review points out that in the review “No mention is made of the similar time work of Renaissance & Baroque musicians. Composers such as John Dowland used layers of rhythm & different tempi quite regularly; examine the score of ‘Lachrymae or Seven Passionate Pavans for 5 Viols’. Most recordings kill the complex rhythms in the piece. A direct result of Wagner’s hugely successful musical revolution in the 19th century. 26. Originating in the Pythagorean obsession with Circles, which, as we have had occasion to mention in various contexts, is the pseudo-symbol of horizontal enslavement to the material world, reincarnation, “The Path of the Fathers,” substituted by the Counter-Initiation for the dear, the blessed Spiral, symbol of vertical Liberation, “The Path of the Gods.” As Alain Daniélou expresses it: “The fifths [in an acoustically valid or Traditional system] form a spiral whose sounds, coiled around themselves, can never meet. For us, this limitless spiral can be the joint in the center of the world, the narrow gate that will allow us to escape from the appearance of a closed universe, to travel in other worlds and explore their secrets.” Music and the Power of Sound, (Rochester, Vt.: Inner Traditions, 1995), p. 8. 27. Daniélou, op. cit, p. 121. 28. “Time Outside” by Patrick Brennan, May 20, 2014, here. Published: October 20, 2015 | This entry was posted in North American New Right and tagged André Pogoriloffsky, book reviews, classical music, James J. O'Meara, music theory, North American New Right, originals, The Music of the Temporalists, weird fiction. Both comments and trackbacks are currently closed. Thank you for the article/review!